American Red Cross Safety Training for Swim Coaches course, developed in partnership with USA Swimming, is intended to teach those involved in competitive swimming how to help maintain a comfortable and safe environment for swimmers; prevent accidents and emergencies; and respond to swimmers with illnesses or injuries in water or on land. Course meets the requirements for USA Swimming and YMCA affiliated coaches. 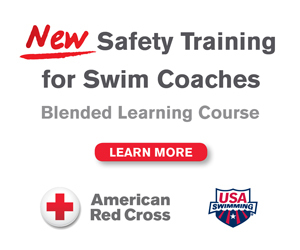 This blended learning course (online and in-person) is offered with two options: Safety Training for Swim Coaches with Adult and Child CPR/AED or Safety Training for Swim Coaches (without CPR/AED). Both course options consist of a 3 hour online session and a skill-based pool/class session of up to 3 hours. Prerequisites: Candidates must be at least 15 years old and complete the online course before coming to class. Certificates Issued: Upon successful course completion, candidates will receive an American Red Cross Safety Training for Swim Coaches certification valid for 2 years or Safety Training for Swim Coaches with Adult and Child CPR/AED certification valid for 2 years. Each class number is a complete course, you only need to attend one class to get certified. Prior to the in-class date participants must complete an online course thru the Red Cross Learning Center. The Red Cross charges $21.60 (with CPR/AED) or $15.20 (without CPR/AED) for the online course which is in addition to the class fees listed above. Instructions on completing the online course will be emailed to you once you register online for a class. Training Forms (will be emailed to you once you have registered); Bathing suit and towel; a pen or pencil and paper for notes; and if you are taking CPR/AED you will need a CPR pocket mask or you may purchase a mask during the class for $20. TRANSFERS – The class transfer fee is $15 and registered participants are required to notify Safe Swim at least 48 hours prior to the first class date that you are currently registered for in order to be eligible to transfer.